Dozens of today’s potential leaders of tomorrow recently gathered in the nation’s capital for a faithbased summit aimed specifically at the millennial generation. The 75 young men and women were picked from all parts of the country to take part in the threeday event discussing the role of faith in today’s society and the importance of religious freedom as part of Canadian society. 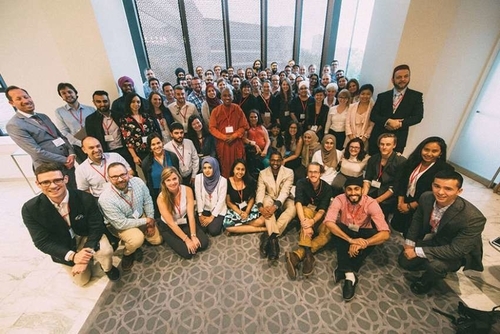 The event, called the Millennial Summit, was organized by the Faith In Canada 150 group, which has been holding a series of meetings and broad-based religious discussions as part of the celebration of Canada’s 150th birthday. All of the participants were born between 1980 and 2000 and came from all types of faith backgrounds. Hannah Marazzi, project lead for the summit, said it was a perfect opportunity to gather those faithful leaders of tomorrow who will play a big part in shaping the country’s next 150 years. ‘Is there a role and place for faith in public life? She said it would have been remiss not to challenge and engage this generation and great efforts were made to make sure young people from all faiths were included in the summit. Among the 75 delegates was Christopher Primeau, vice-president for advancement at Calgary’s Christian Ambrose University. Primeau said that, when he first heard about the Ottawa summit, he was determined to get involved. “To be able to look forward as well as to look back was a great milestone in a year of milestones for our great nation,” he said. “Where is Canada at when it comes to genuine pluralism and the acceptance of diversity in the faith community? It was an opportunity for emerging leaders in the faith community to come together, putting their differences aside and discuss how to create a society around this pluralism and this diversity. Primeau, 31, believes the millennial generation may be less religious than earlier generations, yet is more spiritual. Primeau is delighted to see youngsters in Calgary embrace inter- faith friendships. Meanwhile, he believes the city leads the nation in such attitudes. “Our generation has grown up in an increasingly globalized world,” she said. “We’re more aware than ever that we need to figure out a way to dialogue together, and that we belong to one another, and that our common future is bound up with each other. So how do we listen better and how do we belong more to one another?